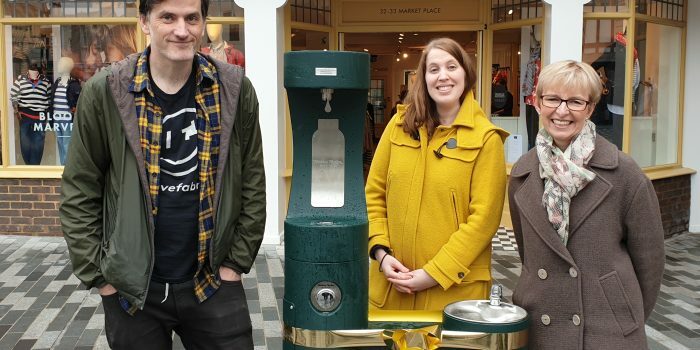 A brand new water fountain has been opened to the public in Kingston Town Market Place as part of Kingston Council’s bid to lower plastic waste including single-use bottles in the borough. The fountain, which is the first of many to be installed throughout the borough, was officially unveiled by Councillors Caroline Kerr and Jon Tolley on March 22nd. Cllr Tolley was the first to use the water fountain that he had spent the last two years campaigning to have installed for the use of everybody in the local community. Later in the day, he took to his twitter to celebrate the introduction of the first of many water fountains that he hoped would not just reduce the single-use plastic consumption in the borough but help rough sleepers have access to clean water. over 2 years ago I first started hassling the powers that be that everyone in the town, but particularly rough sleepers, need access to clean water.